The Golden State Warriors had an amazing 2017 season, collecting the NBA’s best record with 67 wins. Oh yeah, and their best player is getting healthy just in time for the playoffs. There is no doubt that the Warriors are overwhelming favorites amongst basketball fans this year, and our model seems to agree. Of course, a team’s situation can change quickly in the playoffs, and with just one injury, (or nut punch) the Warriors could become a lot more beatable. The toughest test for the Warriors is likely to come from either the Spurs or the Rockets in the Western Conference finals. Our models give the Coach Pop and his well-oiled, Kawhi-bot 3000 a reasonable 33% chance of upsetting the top dog. 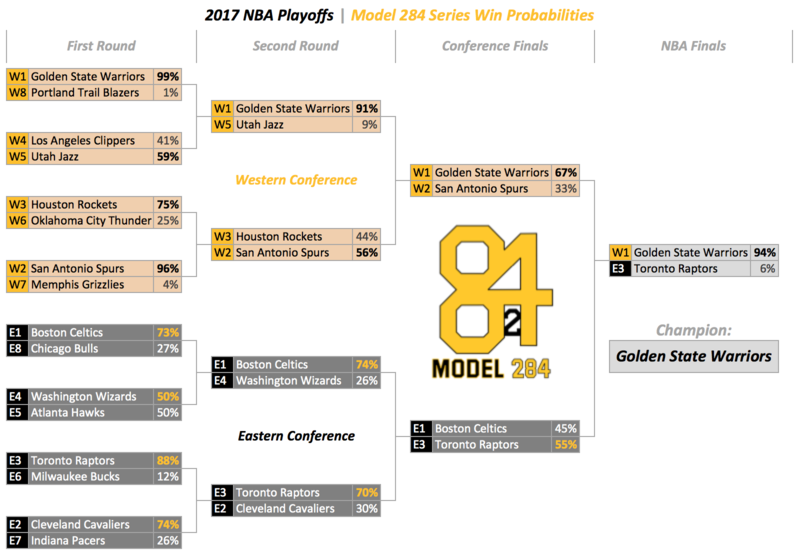 Interestingly, one of our models loved the Houston Rockets, picking them not only to beat the Spurs but also to upset the Warriors, and ultimately win the title. The Rockets are unique in how their organization has embraced the analytics of basketball, and at least one of our models is reciprocating the love. After last year’s epic finals, I don’t think any basketball fan would complain over another Warriors-Cavaliers NBA Finals. Per the models, however, Lebron James’s (and James Jones) amazing streak of 6 straight NBA finals is coming to an end. None of our models have the Cleveland LeBrons advancing to the NBA Finals, as they are projected to fall to either the Celtics or Raptors. It never feels like a good move to bet against LeBron, and the king won’t go down easy, but this season could mark the beginning of the end of his reign over the Eastern Conference. The playoffs are here, the tanking is done, and all that’s left is great basketball. The model is bullish on the Warriors, but, personally, I hope someone can push them to 7! Early 2018 projections indicate that if Tom Thibodeau does not sleep for the entire offseason, he will have the Wolves ready to kick the Warriors off the Iron Throne by the time next year’s playoffs roll around.